I very rarely get excited about nail polish, mainly due to the fact that I am very boring when it comes to color and wear mostly almost-black on my toes and white-ish pink on my fingers. 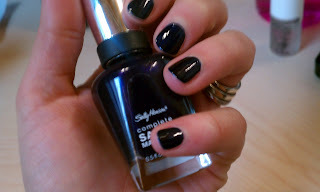 Recently though, I was in CVS and came across this beautiful navy blue polish from Sally Hansen called Navy Baby and had to have it. This looks almost identical to a Dior shade that I almost purchased from Sephora a few months back until I realized that it was 1/4 the cost of my monthly cell phone bill. Or at least that's how I felt. The best part is that this polish is fantastic! I did use a base and top coat even though the whole idea of this line is that you don't need to (sorry Sally, but who the hell doesn't use a top coat?! ), but it actually looked very shiny before the top coat. It also dried in under twenty minutes and lasted for a week. I think that I need Lavender Cloud next, or maybe Midnight in NY? Yes please I love this color! The only draw back I've found is that it's kind of a pain to remove.